Most visitors to downtown Seattle find that a car is not necessary. 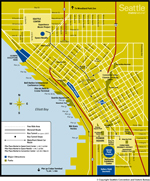 The downtown area is compact and walkable and parking is expensive. The downtown neighborhood offers a first-class international restaurant community, a thriving retail district, museums and performing arts venues. 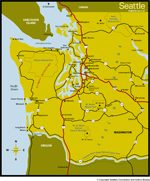 Seattle-Tacoma International Airport (Sea-Tac) is located approximately 15 miles south of downtown Seattle. Town Car Services – Town car services can be arranged through the hotel. Light Rail – $2.75 for 35 minute ride, drops off 2 1/2 blocks from Red Lion at Westlake Center. 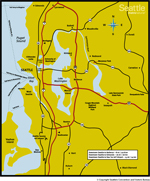 For more information see http://www.soundtransit.org/. Taxi – $30 – $50 one way depending on driver and traffic. Downtown Airporter Shuttle – Picks up on the third floor of parking garage at the airport, drops off 1 block away at the Sheraton Hotel. For more information call 855-566-3300. Shuttle Express – Must make reservations prior to arrival. Between $27 – $50 depending on the number of people. For more information call 425-981-7000 or click to book online.